People with diabetes have a higher chance of having heart attacks and strokes than those without diabetes. Smoking and having high blood pressure and high cholesterol increase these risks even more. Controlling blood sugar, blood pressure, and cholesterol levels are very important for preventing heart attacks and strokes. See your doctor who treats your diabetes as often as instructed. During these visits, health care providers will check your cholesterol, blood sugar, and blood pressure. You may also be instructed to take medicines. You can lower your chance of having a heart attack or a stroke by being active or exercising every day. For instance, a daily 30-minute walk each day can help lower your risks. Follow your meal plan and watch how much you eat. This can help you lose weight if you are overweight or obese. DO NOT smoke cigarettes. Talk with your doctor if you need help quitting. Also avoid exposure to cigarette smoke. Take your medicines the way your providers recommend. Good control of blood sugar can lower your risk of heart disease and stroke. Some diabetes medicines may have a better effect than others in reducing the risk of heart attacks and strokes. If you have had a heart attack or stroke, you are at high risk of having another heart attack or stroke. Talk to your provider to see if you are on the diabetes medicines that offer the best protection from heart attack and stroke. When you have extra cholesterol in your blood, it can build up inside the walls of your heart's arteries (blood vessels). This buildup is called plaque. It can narrow your arteries and reduces or stops blood flow. The plaque is also unstable and can suddenly rupture and cause a blood clot. This is what causes a heart attack, stroke, or other serious heart disease. Most people with diabetes are prescribed a medicine to reduce their LDL cholesterol levels. Medicines called statins are often used. You should learn how to take your statin medicine and how to watch for side effects. Your doctor will tell you if there is a target LDL level you need to aim for. If you have other risk factors for heart disease or stroke, your doctor may prescribe higher doses of a statin drug. Your doctor should check your cholesterol levels at least once a year. Eat foods that are low in fat and learn how to shop for and cook foods that are healthy for your heart. Get plenty of exercise, as well. Talk with your doctor about what kinds of exercises are right for you. Have your blood pressure checked often. 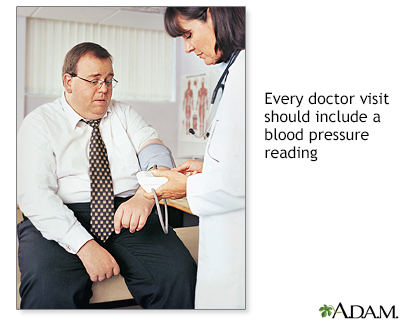 Your provider should check your blood pressure at every visit. For most people with diabetes, a good blood pressure goal is a systolic (top number) blood pressure between 130 to 140 mm Hg, and a diastolic blood pressure (bottom number) less than 90 mm Hg. Ask your doctor what is best for you. Exercising, eating low-salt foods, and losing weight (if you are overweight or obese) can lower your blood pressure. If your blood pressure is too high, your doctor will prescribe medicines to lower it. Getting exercise will help you control your diabetes and make your heart stronger. Always talk with your doctor before you start a new exercise program or before you increase the amount of exercise you are doing. Some people with diabetes may have heart problems and not know it because they do not have symptoms.